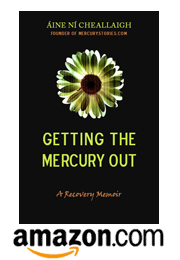 I love following other people’s progress as they post in their blogs about their recovery from mercury poisoning. It’s so great to read about progress and breakthroughs, some of which are so hard-won. So the other day, I was happy to hear about a new blogger on the mercury scene. Her name is Rebecca Samanci and not only is she recovering using the Frequent Dose Chelation protocol, she is also helping guide others through the chelation process. The other blog I wanted to share with everyone is one written by a fellow countryman of mine, an Irishman called Sean O Briain. He has been recovering using the Frequent Dose Chelation protocol for a few months now, and is documenting his progress on his blog. Going online and documenting our success in this fight against mercury is so important. If there are any other blogs or websites out there talking about the Frequent Dose Chelation protocol that I’ve missed, drop me a line at mercurystories@gmail.com so that I can add them as links.